James MinchinConfirming the status of Broken Bells as actual band and not just project, James Mercer of The Shins and Brian Burton, aka Danger Mouse have announced the follow-up to their 2010 self-titled debut, excellent news for those who like their indie-pop with a slice of hip-hop and vice-versa. The new album, After The Disco, will be out on January 14 and the efforts to get people excited about it are well underway. The teaser trailer unveiled last month gave way to the first episode of a Hollywood-flavoured science fiction serial watchable at Rolling Stone, a first preview track from the new album at Pitchfork, and an interview with the duo at NPR. And now there’s tour dates. 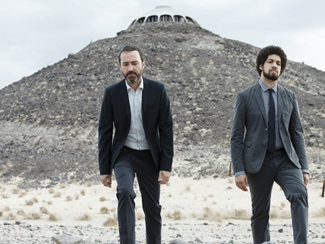 Broken Bells have made a date at The Danforth Music Hall for March 3 with Au Revoir Simone supporting, tickets for which are $39.50 before fees and go on sale Friday at 10AM. But for those looking to take care of business before that and save some money, courtesy of LiveNation, I’ve got two pairs of passes to give away to the show before they go on sale this Friday. To enter, email me at contests@chromewaves.net with “I want to see Broken Bells” in the subject line and your full name in the body, and have that in to me by midnight, November 21. Winners will be notified before the on-sale goes live. Sweden-based Norwegian singer-songwriter Ane Brun will return for a show at The Rivoli on February 14, part of a North American tour. Her last album of new material was 2011’s It All Starts With One, but she also released a compilation album and rarities collection this year. Metro has an interview. Though they’re not nearly the stars they were tipped to be when they first emerged in 2008, anthemically melancholic Scots Glasvegas still have the fanbase to justify a North American tour in support of their third album Later… When The TV Turns To Static; full dates aren’t up yet, but one imagines they’re not coming all the way over here to only play The Mod Club on February 22 at $20 a head. One of 2013’s breakout bands from the UK on the back of their self-titled debut, The 1975 still have a short North American tour on the calendar for December, but will return in the Spring for a much more extensive intinerary, including a stop in at The Danforth Music Hall on May 6; tickets for that are $23.50 plus fees. There’s interviews with the band at The Guardian and KROQ, and a list of potentially life-changing records at MTV Hive. There was a time when moving from a venue the size of The Great Hall to one more than twice that would be a remarkable feat – nowadays, it seems to simply be what happens. And so it’s no great shock that London Grammar will follow up their local debut last month with a return engagement at The Phoenix on April 7, part of a Spring tour following SXSW. Tickets for that are $22.50 in advance and NPR is streaming a KEXP session with the band. Also making a return to a Toronto stage – much sooner than I think anyone expected since they were here just in March – are Nick Cave & The Bad Seeds. I’m not sure if this is meant to be a second leg behind Push The Sky Away or maybe a tie-in to the Live At KCRW live document coming out December 2, but it really doesn’t matter – Cave and company are coming back. They’ll wrap the Summer tour in Toronto on July 31 with a show at The Sony Centre; ticket pricing isn’t available yet but the presale will go tomorrow morning at 10AM – sign up for details. And since you’re already giving them your email, you may as well get the two free downloads from the aforementioned KCRW live album they’re giving away in exchange for your personal information. The Line Of Best Fit has details on the debut album from UK psych-rockers Temples, just in time for their local debut show at The Horseshoe tomorrow night. It’s called Sun Structures, will be out February 11, and one of the tracks on it will sound like this. There’s also an interview at XFM.